John is a freelance journalist and has written for magazines including New Scientist, Science (online), Bicycle Times, and Slate. His work has appeared in daily newspapers and online news sites, and he has also reported on health and the environment for public radio stations. Despite his last name, John's not generally a violent person. I’m excited to share that I’ve signed on as a correspondent with Mongabay.com through the Global Forest Reporting Network. It’s a great opportunity to tie some of the fantastic data now available at Global Forest Watch to what’s happening on the ground in the world’s tropical forests. 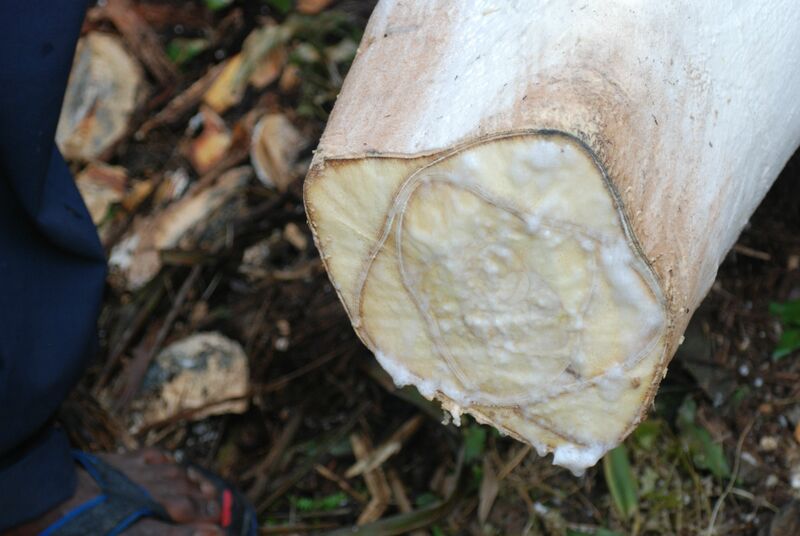 Here’s my first submission, on deforestation trends and new forestry laws in Cameroon. Keep an eye out for other pieces from journalists all over the world. Being stuck in Goma after our evacuation from Lodja, it turned out, afforded us the opportunity to visit Africa’s oldest national park. 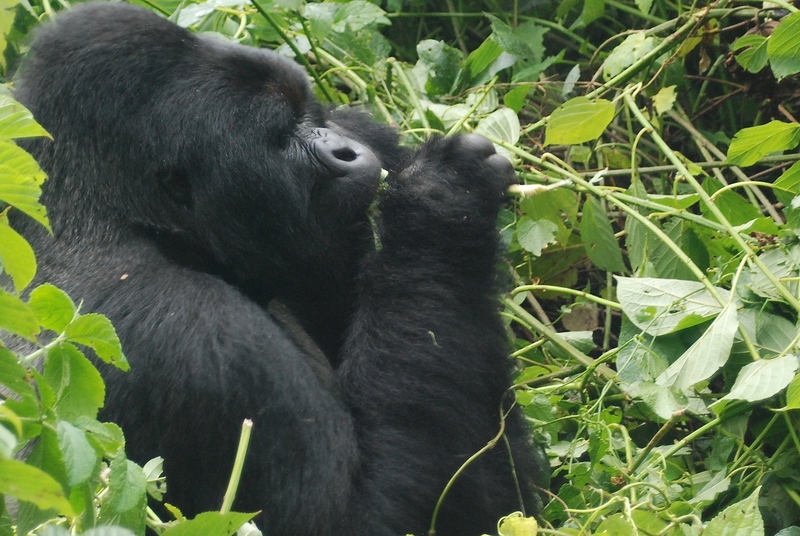 A short but bone-jarring 40-km ride away lies Virunga National Park, best known for its flagship species, the mountain gorilla. But this massive preserve seems to encapsulate all of Africa in the same area. Check out a stunning, 14-minute video overview of the park to see what I’m talking about. Home to mountain and lowland rain forests, wet savanna, and a spine of dormant and not-so-dormant volcanoes that straddle the equator, it’s also a haven for people displaced by conflict and various rebel groups who seek it out for the very difficulty of access that makes it so poorly known. 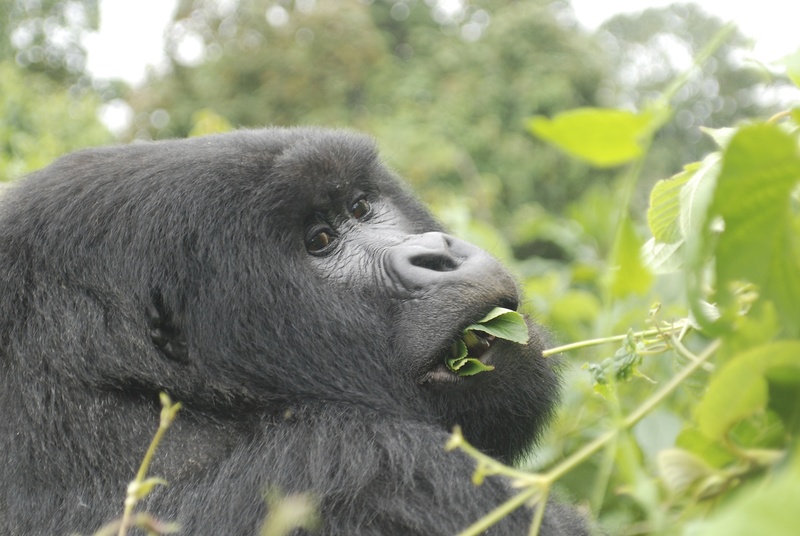 We spent just over 24 hours in the park – enough time to soak up some of the superb accommodations and service at Mikeno Lodge and to hike into the mountains and visit the gorillas. I’ve included a few pictures below that struggle to capture what a surreal experience it was. 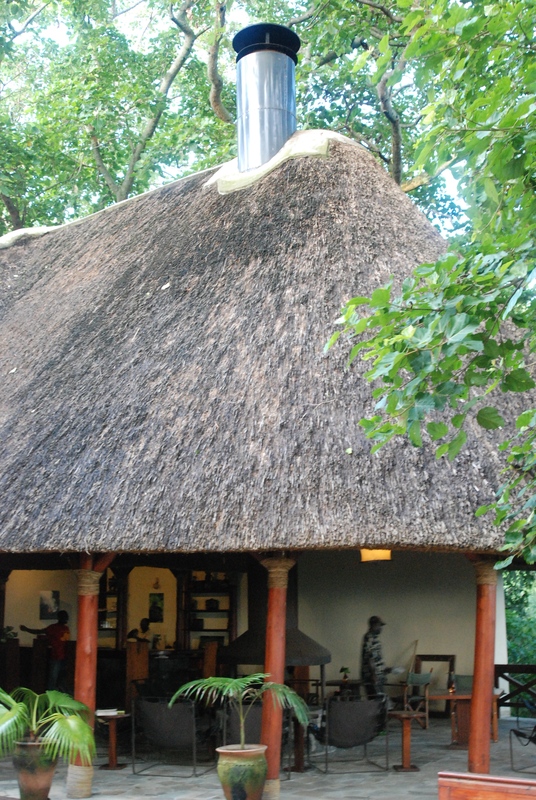 Mikeno Lodge sits perched over a forested valley brimming with resident wildlife – tree-dwelling monkeys, scavenging baboons and chimpanzees are common visitors. We had beautiful weather, including a rare view of Mount Mikeno, all the way to the park boundary. 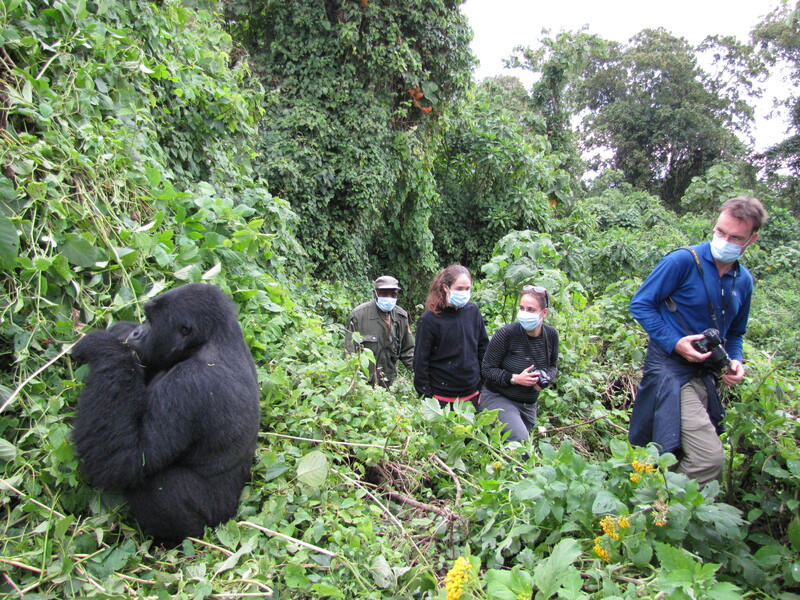 It started to rain almost as soon as we entered the forest, but after following a forest elephant’s path and scaring up a few buffalo, we found our gorilla family. 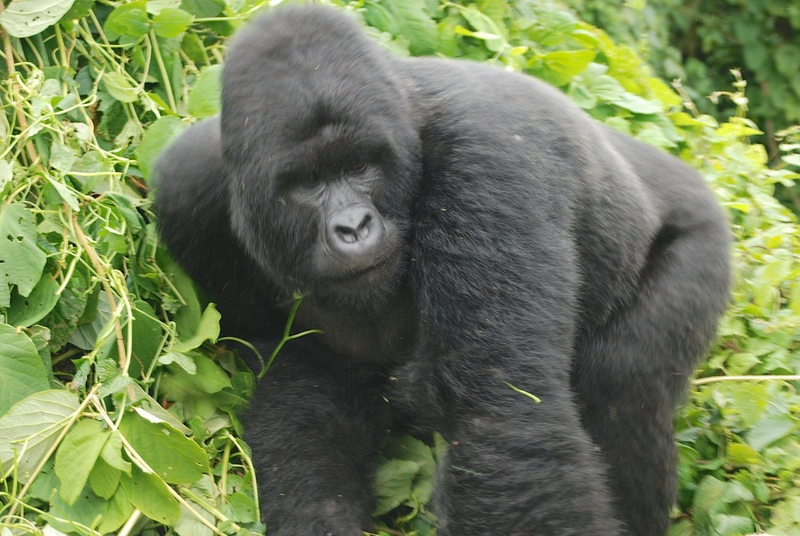 The silverback’s mother sat off to the side, eyes missing nothing happening in the midst of her family. 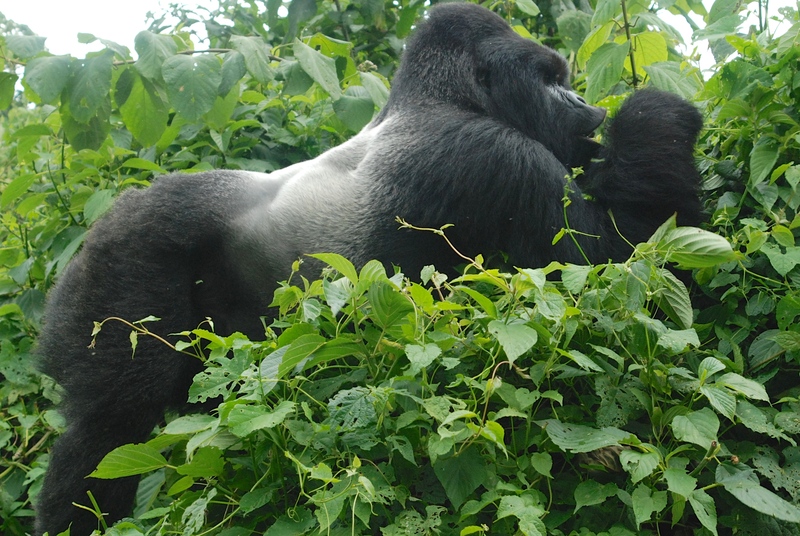 After a bit of initial bluster from the silverback until he recognized our tracker Yaya, the family ignored us in favor of the vegetation around them. 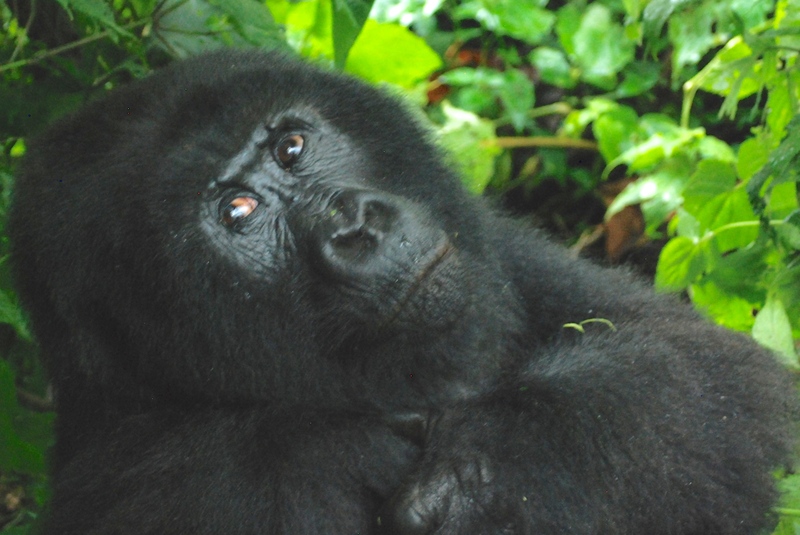 The gorilla’s intelligent eyes make clear he’s a hominid. The proportions of his body, however, tell another story. This little fellow was the only member of the family to show us much interest. 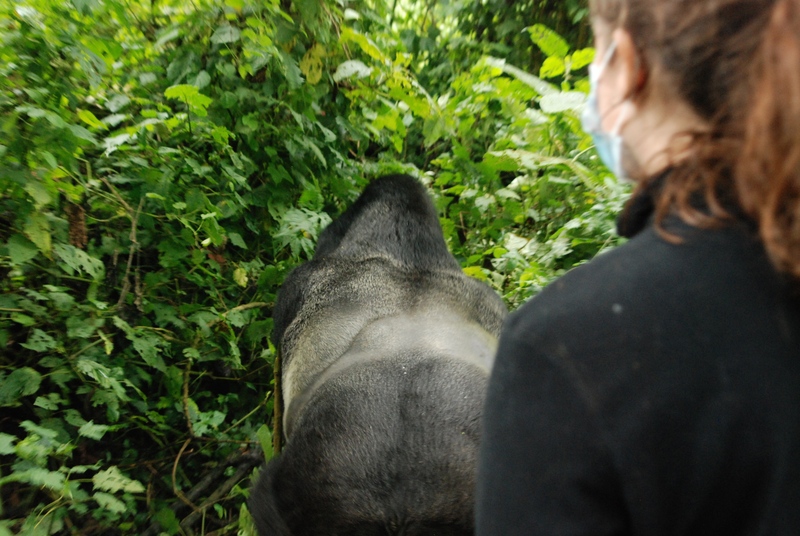 The silverback couldn’t be bothered. The weather turned quickly. 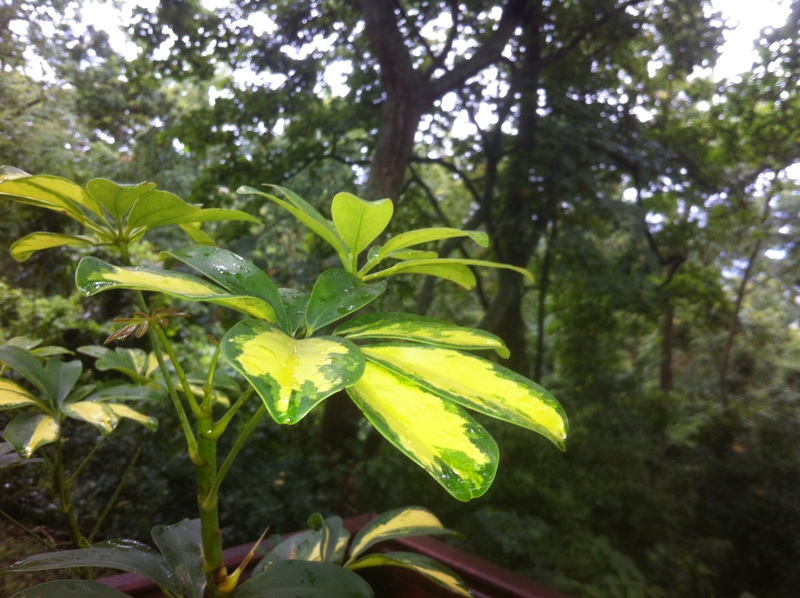 By 1 pm, we learned why everything was so green. 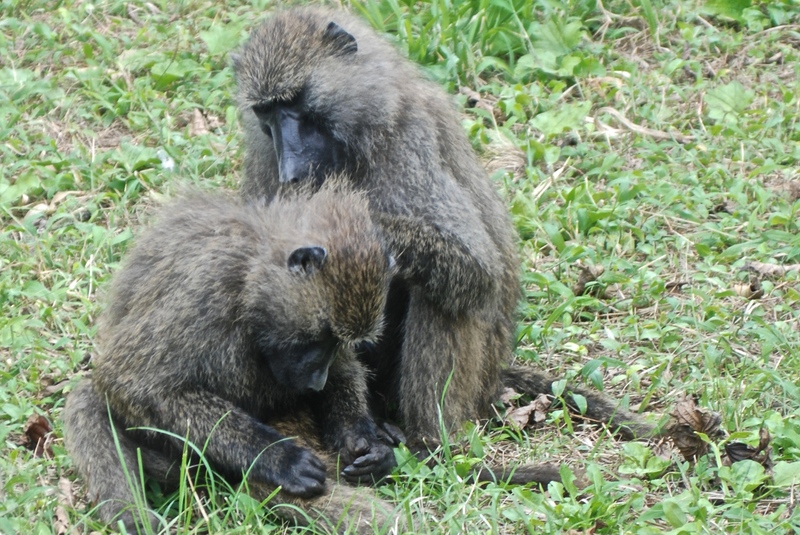 We found other primates back at the lodge, including these olive baboons. 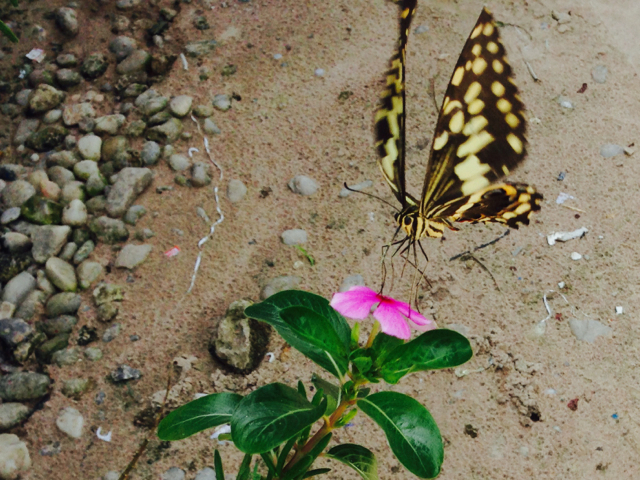 I took a picture of this beauty just before the first squad of savanna folks passed by the office. 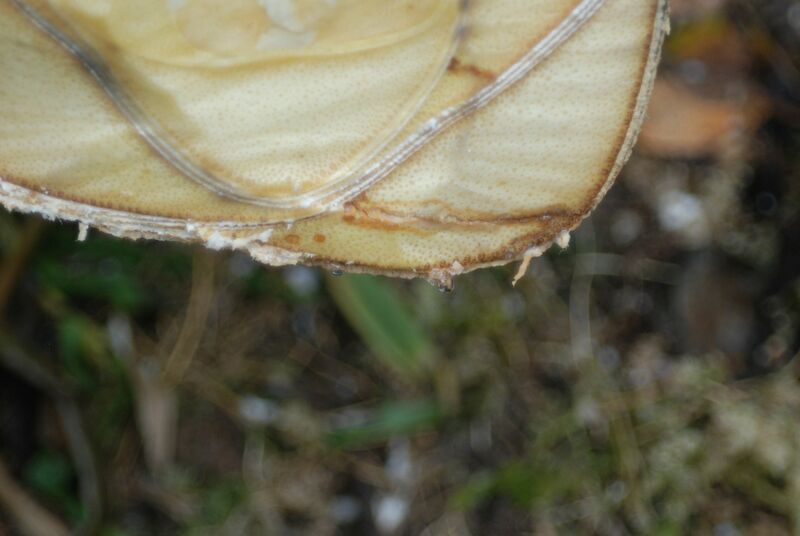 Not much to do with this post, but Order Lepidoptera is well represented in central Congo, to my constant joy. I’m working on four short blog posts that I’ll roll out over the next few weeks to sort of explain what Anne-Claire and I have been up to, and what has happened to us over the past month. Though there have been some potentially scary moments, we’ve managed to see a few new things and we certainly can’t complain about what we’ve been able to see. The raft of changes was ushered in by our evacuation from Lodja to Goma. For anyone who’s at all familiar with African politics, the fact that we were flown to Goma, the veritable seat of instability on DRC’s eastern border, should strike you as ironic, especially given the relative security and sense of safety that we’ve experienced and I’ve written about since arriving in Lodja. In fact, though, it made sense due to its proximity to Lodja by UN flights, and also because with years of instability, NGOs there have a plan when things go awry. 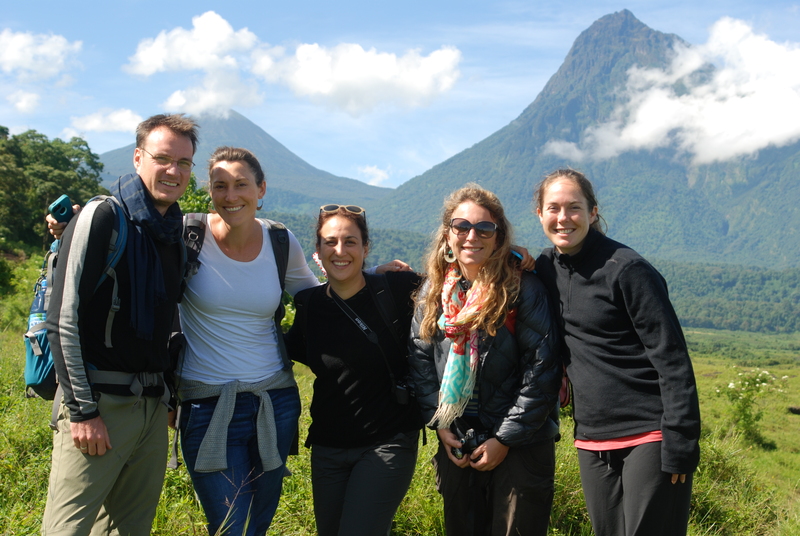 I’m quickly coming to regard the flights between Lodja and Goma as some of the most stunning I’ve ever been on. 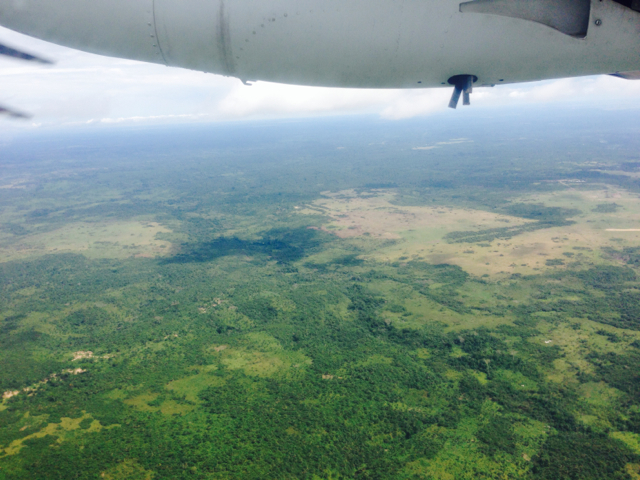 We often fly low enough that this is the view for much of both flights, until we hit the Albertine Rift and Lake Kivu in the east. And that’s just what happened in Lodja last month. It’s a bit of a long story, but basically long-festering tensions between loosely affiliated (for the vast majority of the population) groups, one whose members identify themselves as being from the savanna and another whose members identify themselves as forest people. As so often happens in venial societies that engender self interest, the leadership of each group is highly centralized and manipulative of the supposed conflict for their own ends. The morning of March 25, the strongman of the savanna group, a 20-something enforcer, was shot and killed outside of his house, which happened to be right across the street from where Anne-Claire and I live, and not far from the office – where we were at the time. We had little idea that anything was wrong, until later that afternoon, when groups of young men ran past the office yelling and singing and carrying machetes. 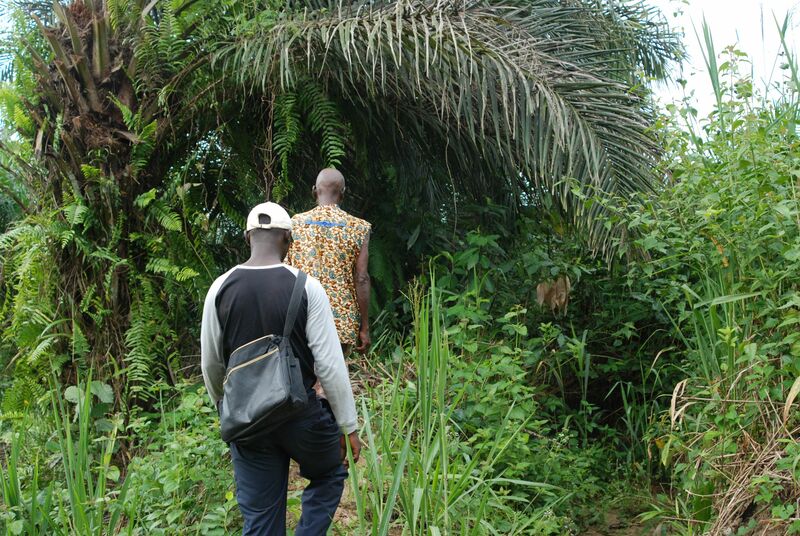 Groups of savanna affiliates set fire to houses of forest people, and we saw one man staggering down the road who had been struck three times in the head. He was bleeding a lot, but one of our colleagues saw him being stitched up at the health center a few hours later. The machetes, it seemed, were mostly employed to hack apart bamboo fences and pull them apart for those who didn’t have weapons. 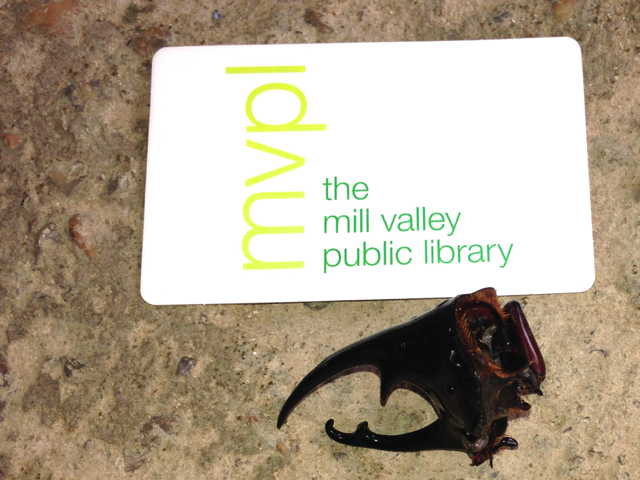 Another non-sequitor: I found these mandibles while walking around the UN airport in Kindu. I searched and searched, but couldn’t find the corresponding body. It was unsettling to say the least, but at no time did we feel targeted, or for that matter even acknowledged by the two sides. Still, the leaders of Anne-Claire’s organization prudently organized our evacuation. 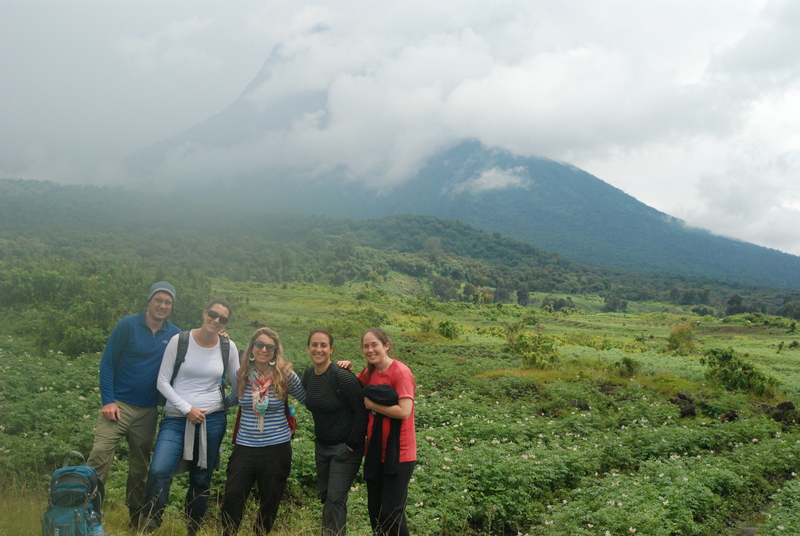 So after two nights spent on the outskirts of town in a guesthouse run by the Passionists, a UN plane came to the airport and took us first to Kindu and then on to Goma the next day. In all, 86 homes were burned and from what I’ve heard, one other person was killed. We heard maybe a dozen shots throughout the day, coming from single-shot, colonial-era guns or homemade contraptions used for hunting. Our colleagues who have spent time in South Sudan assured us that we were lucky there are so few guns in Lodja. Machetes, they said, are much less efficient weapons. Little consolation, perhaps, to those who were in fact injured, but given the overwhelming emphasis on the community and not the individual, it’s not surprising, nor if you consider the West’s preternatural obsession with statistics, and not individual stories, to paint a picture of, and direct policies regarding, the developing world. 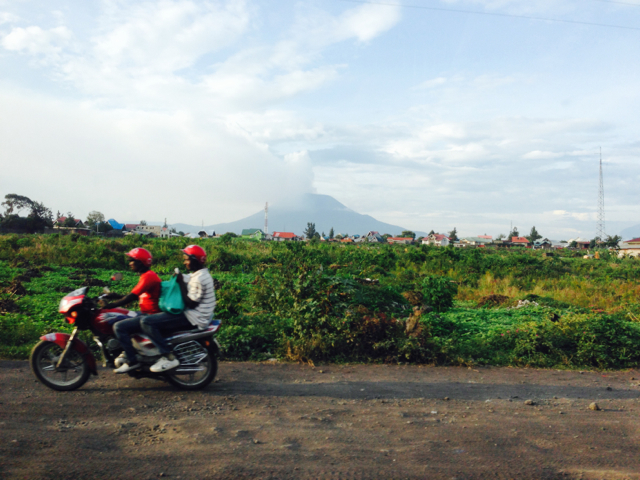 Nyiragongo fumes in the background, 40 km from Goma. The helmets worn by the taxi man and his passenger are a new safety initiative in Goma – a promising step in the right direction, I think. 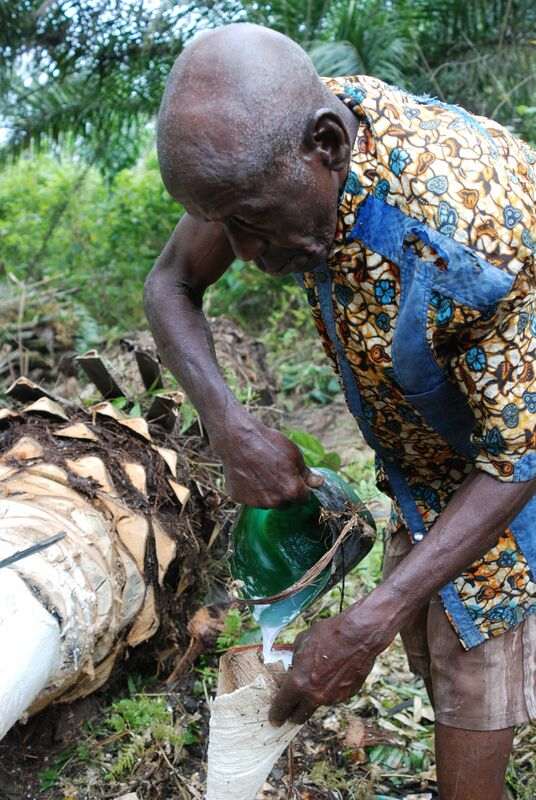 Just about every week, we have a spry older guy from the forest who comes and sells us palm wine. Usually, we can’t drink the five liters he sells us – not because of the alcohol content, which I figure sits somewhere between Odoul’s and Michelob Ultra. But we share it with people, and it’s so cheap at 300 francs (0.33 USD) a liter. So we arranged to visit him and see how it was made. The actual process requires a lot of physical labor, but I spent about two hours watching the exciting part. It’s sort of like harvesting maple syrup, only you have to cut the whole tree down. I took loads of pictures, which I thought might do a better job (with captions) of explaining the process. I met “Papa Jean” at his home in the forest. From there we set off down the trail and at one point he and JP – our guard and motorcycle taxi man – launched into an invisible hole in the brush. 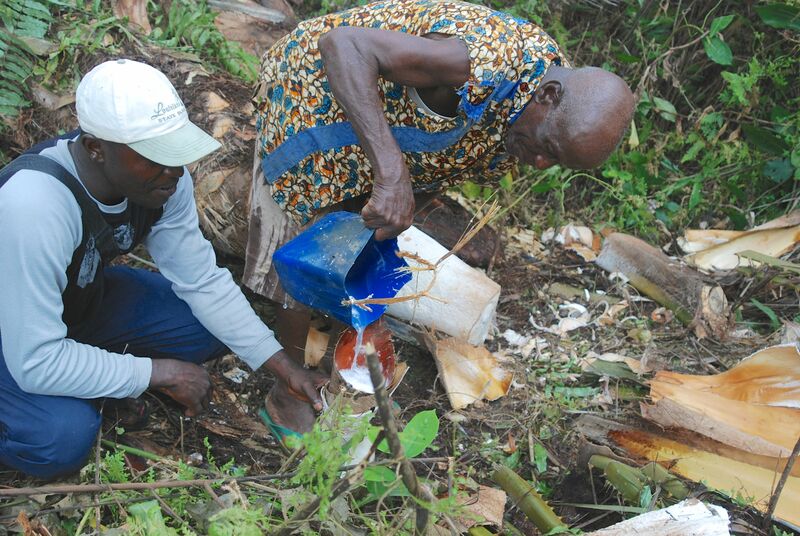 Papa Jean had already cut down and de-branched the tree, and this plastic container secured with palm bark is collecting the sap. Here, he’s removed the container and is collecting the “wine” in another receptacle. 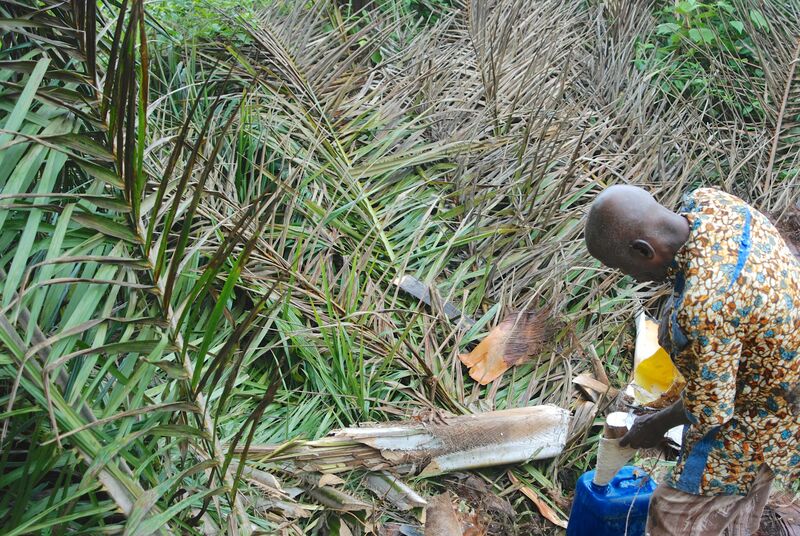 From a 15- to 20-foot palm tree, he collects about 5 liters twice a day, for up to 2 weeks. 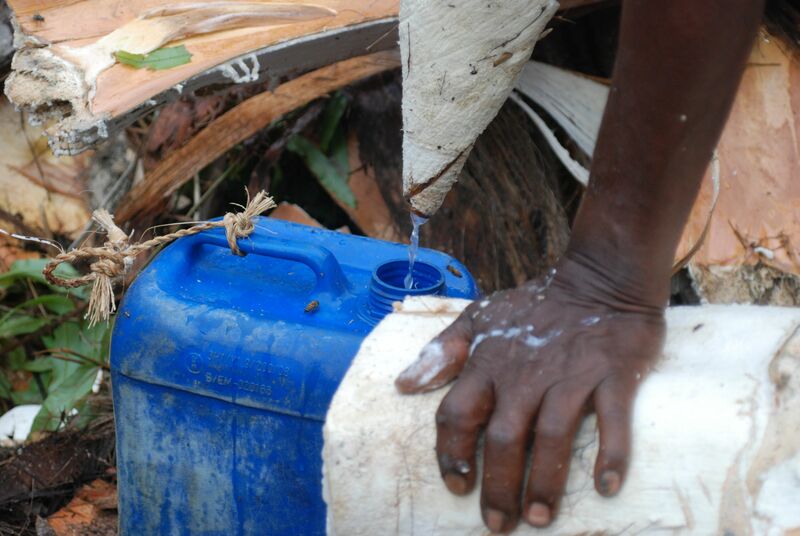 Papa Jean has rigged up a filtration system with palm bark – one reason his palm wine is free of debris and bugs, and a big reason we buy from him. 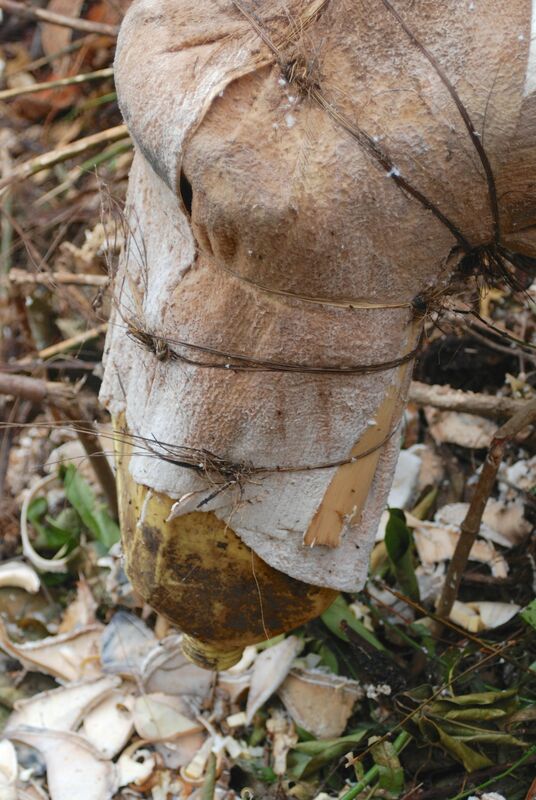 The palm sap drips out of the trunk of a fallen tree. 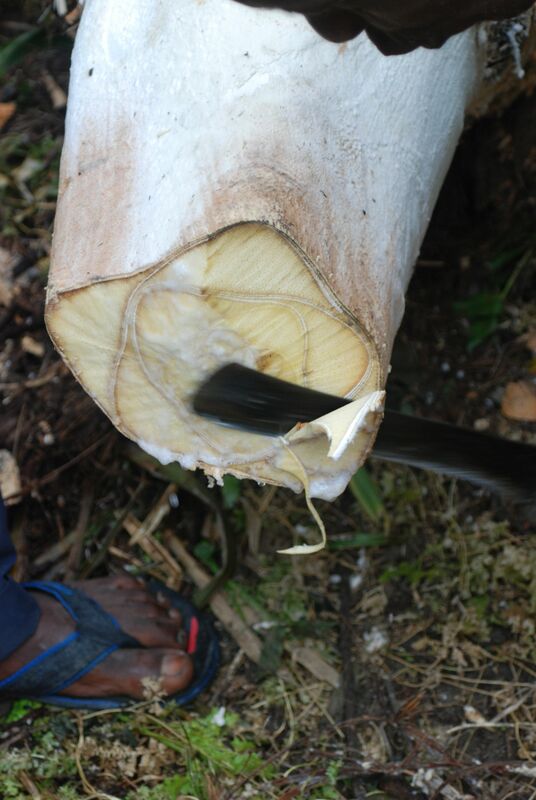 Twice a day, he uses a razor-sharp machete to open the tree trunk’s pores and keep the sap flowing. 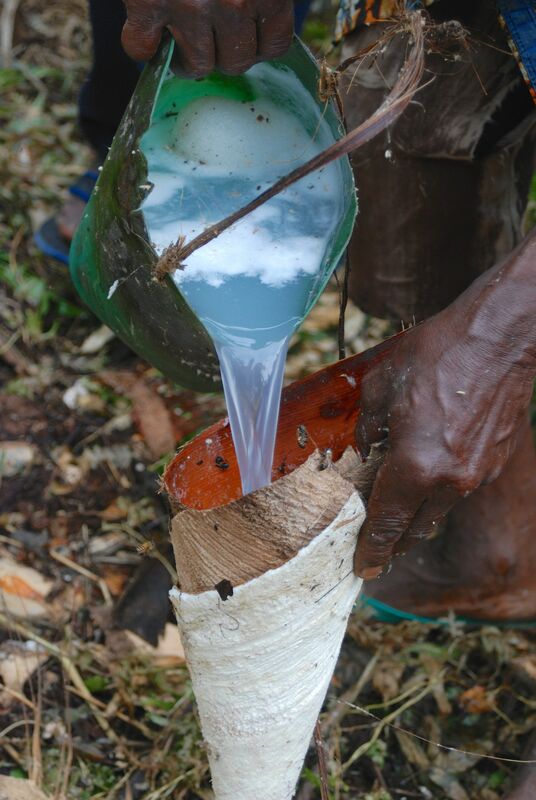 The sap drips from the spongy trunk. We visited three different trees, the wine from which Papa Jean will take the 13 kilometers into Lodja to sell from his bicycle. 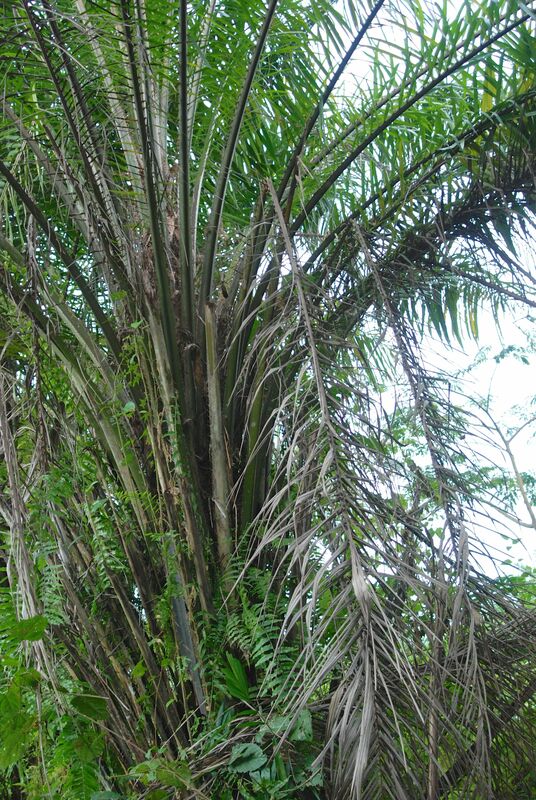 These palm trees grow quickly and produce a massive amount of foliage. We have a few in our yard, and I usually have enough strength to hack off two or three fronds at a time. Before tapping the tree, Papa Jean and his helpers hacked off all of the fronds, leaving them to decompose on the forest floor. 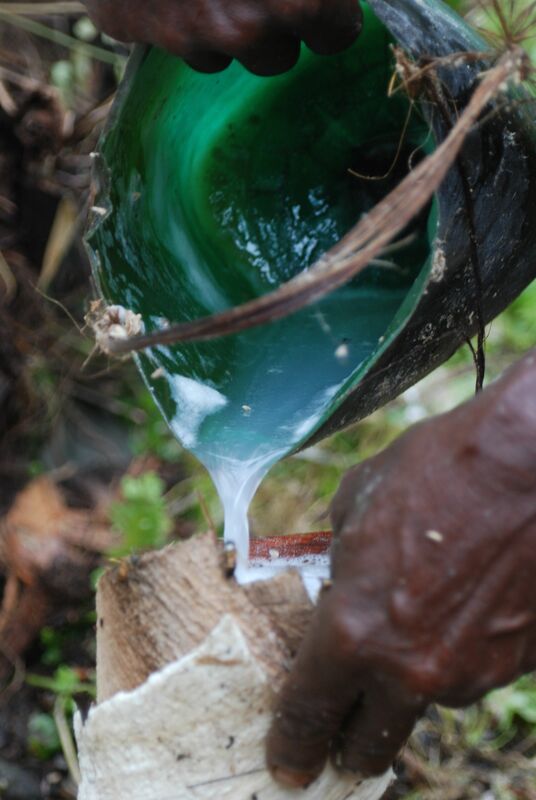 Sap comes bubbling out almost immediately after trimming the wood. The wine has a slight carbonation, and cold, it’s quite refreshing. 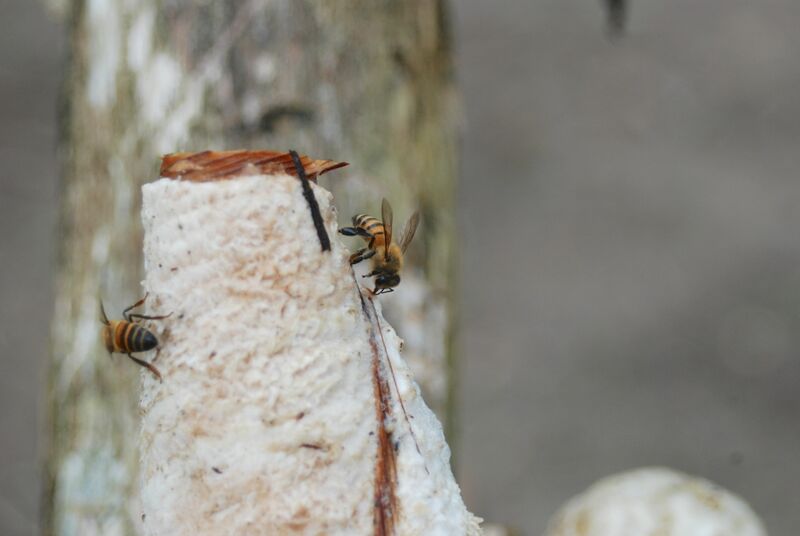 The honey bees like it too. 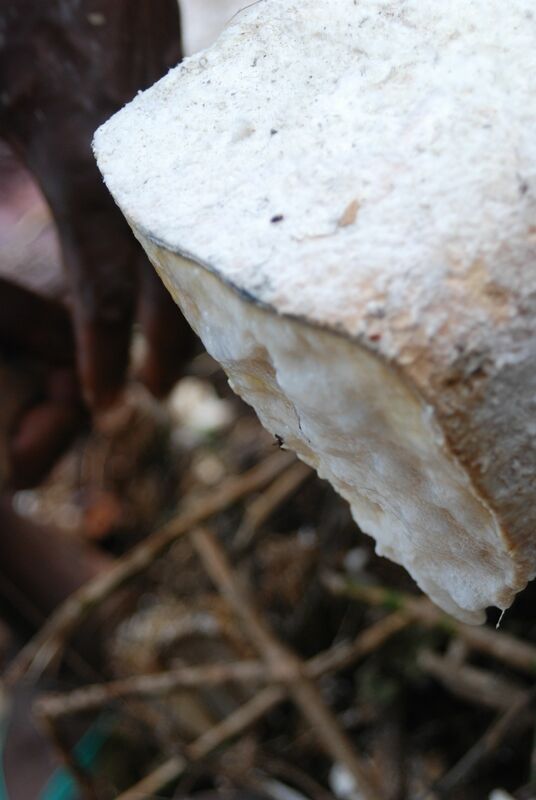 The produce some delicious honey and are among the most docile and least aggressive I’ve seen. 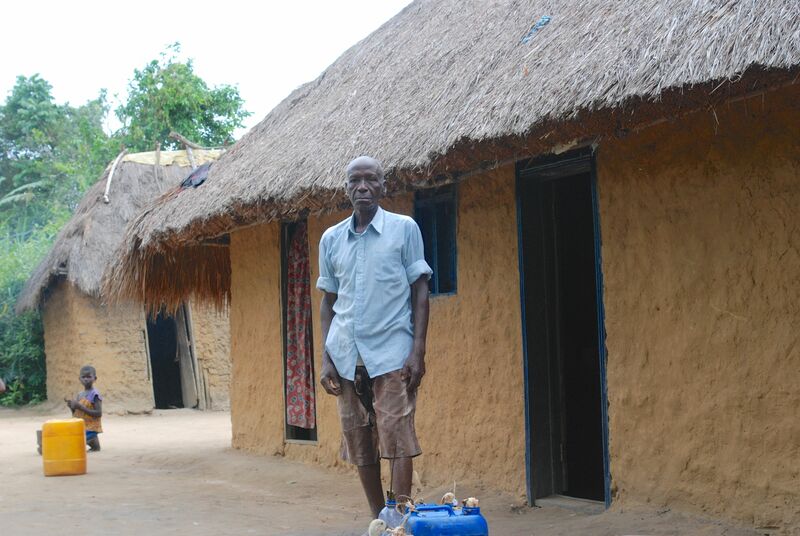 Papa Jean stands in front of his house after the morning collection. 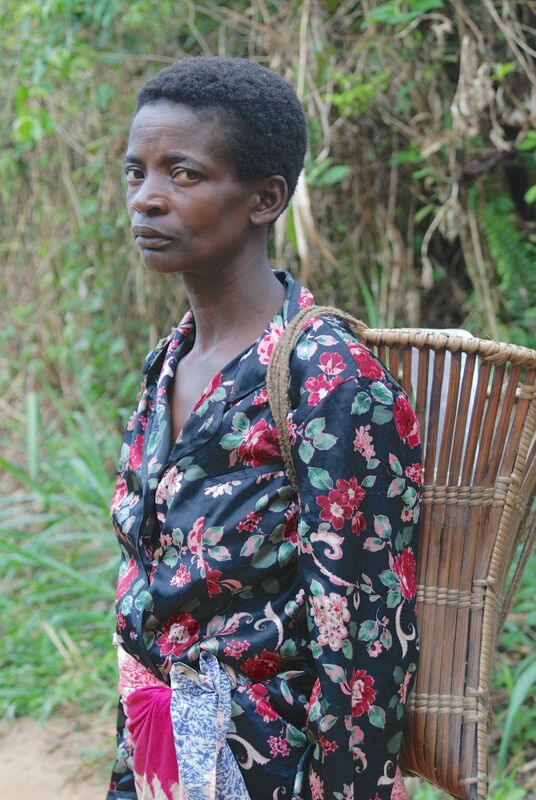 Women weave these ergonomic baskets and used them to carry extremely heavy loads of pineapples, firewood and just about anything else on long trips from the forest to Lodja and back. 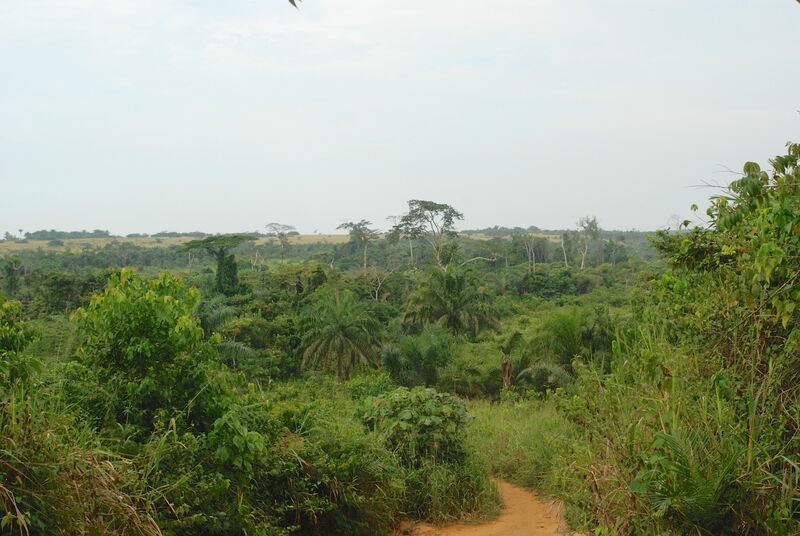 The view from the road, snaking down into a small river valley and then back up to the plateau on which Lodja sits. Anne-Claire made this recording Thursday evening on the way home from work. As I’ve said before, I’m constantly amazed at how loud Lodja is, given that there’s no grid electricity and we’re about a thousand miles from a city that anyone in the Western Hemisphere would recognize. Yet, on any given day at any time of the day or night, you’re likely to hear an impromptu parade, a choir practice or an amped-up pastor forcefully unleashing his fervency into a crackly microphone-amp combo. The latter most often happens between the hours of midnight and 4 a.m.
At my most cynical, I blame two things: the lack of employment opportunities here in Lodja, and the preponderance of medications available. First, there’s little formal employment here in Lodja beyond agriculture and fish farming. On days when there’s not much of that sort of work to do, you’ll find a lot of men sitting around throughout the day, drinking, napping and apparently saving up energy for a rollicking night. That’s not to say all men are lazy here. However, you’ll never see a woman doing nothing unless she has just given birth, has been hit in the head with a coconut or is gravely ill.
As for the pan-availability of prescription drugs, anyone with the equivalent of a high school diploma can open up a little shop, from which they sell whatever medications they can get their hands on. They might know a little bit about what the medication is intended for, but they often can’t predict the side effects. Imagine giving someone a handful of Sudafed if they’ve got a cold and turning them loose with little advice on dosage. They’ll be spinning like a top in no time, and that seems to be what we hear at night, aided considerably by a solar panel and a car battery to amplify whatever the hell they feel like shouting about. On a more pleasant note, impromptu singing and dancing also happens on a regular basis, and that can be quite lovely. These women just told Anne-Claire they were “the Methodists” Thursday. It was late, so the video’s not great, but I think it gives you a good idea of the unpredictability of life here. 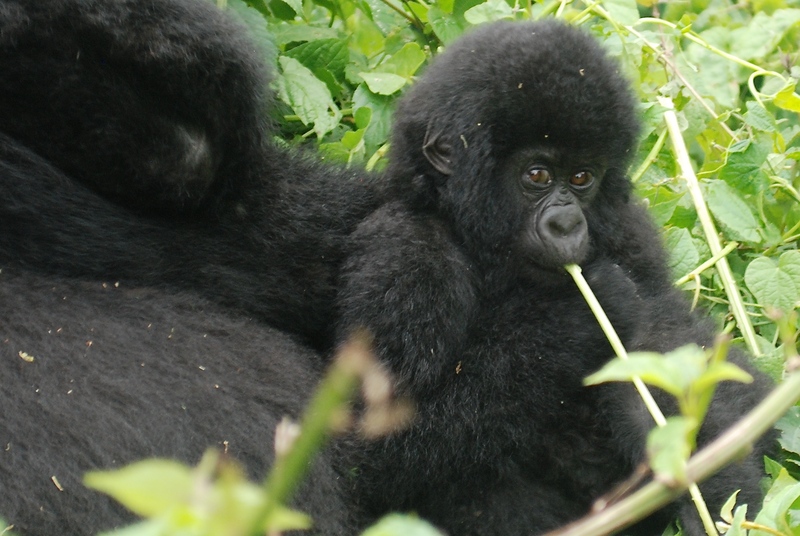 Virunga National Park in the Congo DRC is Africa's oldest national park and home to a quarter of the world's mountain gorillas.